One of the most time-consuming parts of the crop breeding process is the time needed to grow successive generations of plants. What if we could really speed that up? That’s the goal of a project at the National Research Council of Canada (NRC). The accelerated growth methods used in this project could potentially trim several years off the breeding process, providing a big boost to the development of improved crop varieties. For instance, imagine the challenge for a breeder who is trying to address an urgent threat, like a very virulent new strain of a major pathogen. “Sometimes it can take 10 to 13 years to get new varieties out into the marketplace. Pathogens can evolve quickly and spread around the world. They don’t sit around and wait for the breeders to catch up with them. 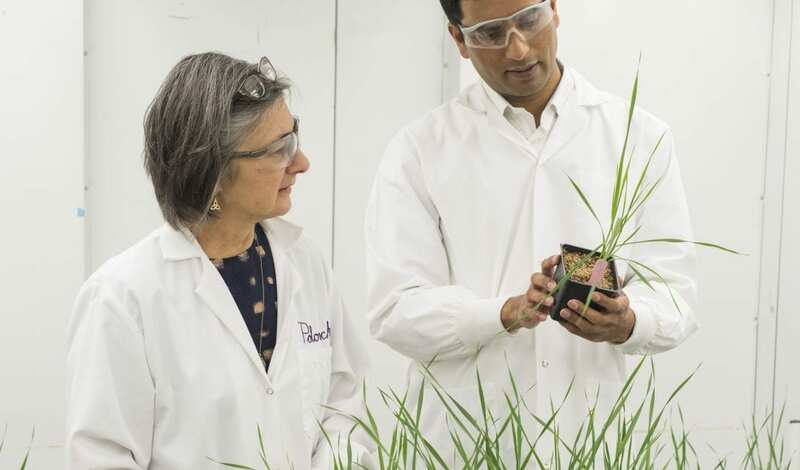 So the faster that the breeders can introduce new forms of disease resistance into a crop, the better,” notes Dr. Patricia Polowick, another NRC researcher involved in accelerated growth studies. In his project, Rajagopalan’s team is applying multiple methods to speed up wheat growth and looking for the best combination of these methods that will take the plants from seed to flowering and maturity in the shortest time. One intriguing method involves growing plants under constant light. “The use of continuous light for accelerating crop growth was adopted initially by a group of Australian researchers in collaboration with others around the world. They were inspired by experiments conducted by NASA [National Aeronautics and Space Administration] in the 1980s and 1990s looking at growing plants in controlled environmental conditions including constant light,” Rajagopalan says. The NASA scientists were experimenting with the use of plants to help maintain human life in space. “In these experiments, they observed a linear effect of light on photosynthetic rate and production of plant biomass. In simple terms, photosynthesis is the process by which a plant converts atmospheric carbon dioxide into storable sugars using energy that comes from sunlight, and in the process it emits oxygen back into the atmosphere. [The scientists observed that] if you increase the supply of light to the plant, then it continues to perform photosynthesis and continues to grow more and faster and produce more biomass,” he notes. Rajagopalan notes other environmental stress factors can also accelerate plant development in a similar way. So, along with constant light, the project is testing factors like moisture stress, nutrient availability stress and stress from smaller pot sizes. The research team is also using a propagation method called embryo rescue to go more quickly from one generation to the next. “We harvest seeds before they are fully mature and dried, and harvest the embryos from these grains, put the embryos on nutrient media plates and get seedlings from them. That can save us a few weeks, instead of waiting for the grains to mature and dry,” Rajagopalan explains. The project’s four objectives mainly relate to determining optimal procedures for accelerating growth of Canadian wheats, seeing how many generations they can get per year, and increasing understanding of the effects of these accelerated growth conditions on plants. They are focusing on Fusarium head blight and rust because of the relevance of these diseases to Canadian wheat production. “We looked at Fusarium head blight because it’s an increasing problem in the wheat-growing regions in Western Canada. The statistics from the last 10 years show the incidence of Fusarium head blight in wheat in Canada has increased almost every year; 2016 was a particularly bad year. Not only does this disease reduce yields but it can also produce toxins, like deoxynivalenol (DON), which can downgrade grain quality and affect the marketability of the grain. So it’s a pretty devastating disease economically,” he says. Like Fusarium head blight, rust is a major disease concern in Prairie wheat crops, and many Canadian researchers are working on rust resistance. Rajagopalan’s project is targeting leaf rust, a common disease in wheat. Under conditions that favour this disease, susceptible wheat varieties can suffer very serious yield losses. Over the years, several leaf rust resistance genes have been introduced into Canadian wheat cultivars and then the pathogen has evolved to defeat that resistance. The project’s second objective is to see if responses to the accelerated growth methods vary among different wheat varieties. 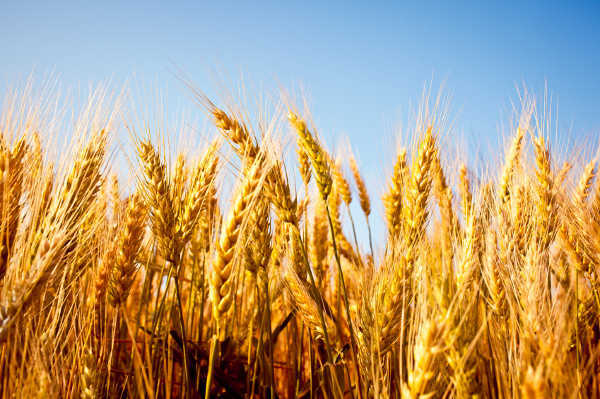 This extensive work involves testing multiple Canadian varieties of bread wheat and durum wheat and determining which combination of acceleration methods is best for each cultivar. “We want to see if we can do any tailoring of conditions for particular varieties,” notes Rajagopalan. The third objective is to rapidly generate a recombinant inbred line population under accelerated growth conditions. Such lines are very useful for mapping traits in a plant’s genome. The lines generated in Rajagopalan’s project will be used in other projects to characterize resistance genes for rust diseases in wheat. Polowick adds, “One of the reasons we want to look at the long-term effects is because we are putting the plants under a lot of stress.” Breeders will want to be sure plants grown under induced stresses to accelerate their growth will respond to things like diseases and insect pests in the same way when they are grown under normal conditions. This two-year project started in April 2017, and Rajagopalan’s team has already completed two of the objectives. “We have completed the testing of the effects of Fusariumand rust resistance in different varieties under normal and accelerated growth conditions. And we have completed the very large-scale study to understand the effects of accelerated growth conditions on various wheat varieties. So we have a really good understanding of what conditions work best for the multiple varieties of durum and bread wheat that we have tested.” The researchers are currently working on the other two objectives. The effects of the accelerated growth conditions are very impressive so far. “Right now, we are getting about five to six generations of wheat within a year using these conditions. For plants grown under normal conditions [in a greenhouse], you will get around two to three generations per year. So you can reduce the generation time of the plant by half by adopting these conditions,” says Rajagopalan. Along with the potential for large, rapid steps forward in Canadian wheat varietal improvement, other crops could also benefit from the powerful combination of accelerated breeding and valuable new traits. Australian research shows speed breeding can also work in such crops as barley, chickpea, pea and canola, with the number of possible generations per year depending on the crop type. 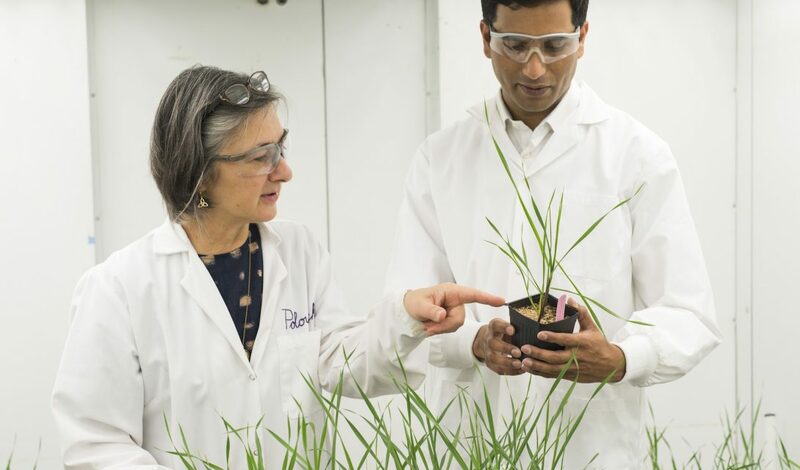 “We would love to see wider adoption of these accelerated breeding methods that we are working on in Canadian wheat breeding programs and to also make progress in other crops where this approach is applicable,” Rajagopalan says. His project is funded by the Saskatchewan Ministry of Agriculture, the Canada-Saskatchewan Growing Forward 2 program, and the National Research Council of Canada. 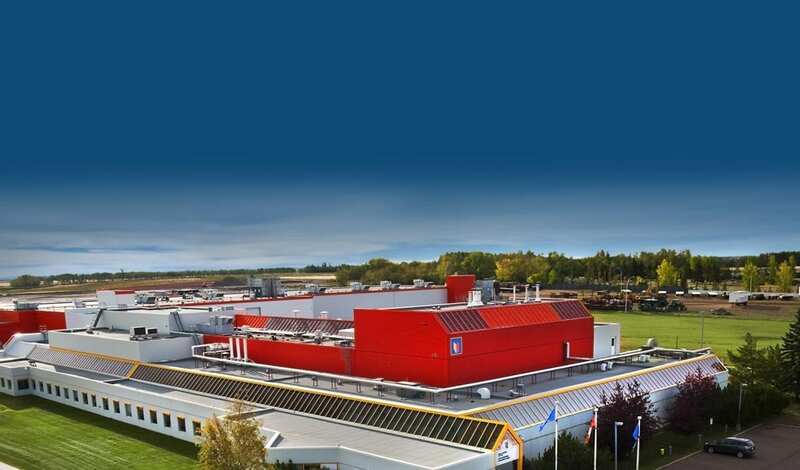 The Food Processing Development Centre (FPDC) is located in Leduc, Alberta. The production of primary commodities and value-added products is vital to Alberta. Ensuring Alberta producers are getting best value for their products is part of the mandate of the province’s Food Processing Development Centre in Leduc. The Food Processing Development Centre (FPDC) is a modern, fully equipped pilot plant and product development laboratory facility. Staffed with experienced food scientists, engineers and technologists, it is operated by the Food and Bio Processing Branch of Alberta Agriculture and Forestry (AF). Alberta Agriculture and Forestry provides unique facilities to provide development and research services for agri-food processing companies, as well as those interested in non-food uses for agricultural products. 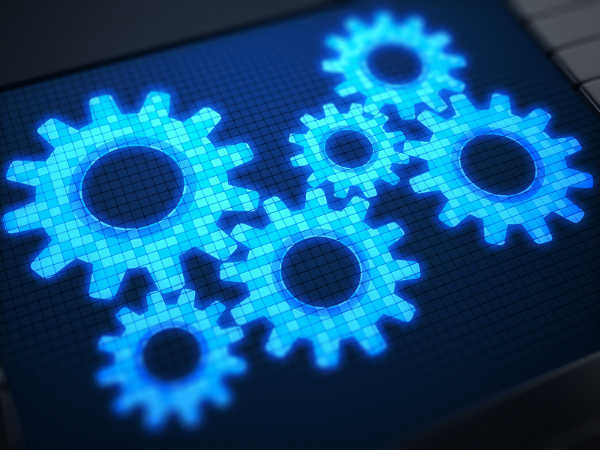 The food and beverage industry is Alberta’s largest secondary manufacturing industry, generating in excess of $13 billion in value of shipments. Through the Alberta Heritage Savings Trust Fund, AF opened the centre in 1984. A $5.5 million expansion to the facility was completed in 2002. Over the past 34 years, a wide range of products have been developed at the centre, from processed meats and cheeses, to baked goods, juices, soups, sauces and baby food. According to Aubee, Alberta’s commodities are often processed outside of Canada, and in turn, the province then imports these value-added products. The FPDC does work on projects from outside Alberta, but the majority of projects are Alberta-based. For instance, Siwin Foods Ltd. is one of the centre’s success stories. Siwin Foods is a Chinese company that was looking to establish a processed meat plant in either North America or Australia. According to Aubee, the services the FPDC offered made the decision for Siwin. Adjacent to the FPDC is the Agrivalue Processing Business Incubator (APBI), a multi-tenant facility providing infrastructure and services to support and enhance the establishment and growth of new companies and new business ventures in Alberta. The APBI assists with the start-up of new food businesses, providing facilities and programs to help manage the transition from new product development through commercialization, market launch and growth in sales, resulting in graduation and the establishment of their own facilities. Alberta-based Aliya’s Foods Inc. was a small company producing and manufacturing samosas east of Edmonton. The company recognized the potential growth in Indian cuisine and wanted to expand their operation to include prepared ethnic meals. After accessing the product development and evaluation services of the FPDC, they leased a suite in the APBI. The FPDC and APBI have a staff complement of 45 people consisting of food safety professionals, food scientists, food technologists, maintenance and administration. The facility is home to PhD and Masters degree food scientists with specializations in crop and plant protein processing, meat processing, dairy processing, sensory science and bakery science. Going forward, the FPDC offers Alberta growers the opportunity to increase their acres and/or the possibility of growing new and novel crops in the province. Indeed, Aubee says the centre is seeking new and different sources of food protein to experiment with. The FPDC is one of the largest food processing development centres in North America, and one of the most complete with the APBI. An expansion to the APBI was announced in 2016 as part of the Alberta Jobs Plan. Planning is currently underway for this expansion, offering Alberta growers – and companies – myriad opportunity to create added value to the province’s high-quality crop offerings. Ziemienowicz explains that not all of the applied fertilizer is actually used by the crop, and the unused portion can cause problems including pollution of water sources for humans, livestock and aquatic species, and emission of nitrous oxide, a very potent greenhouse gas. In addition, production of synthetic nitrogen fertilizers is very energy-intensive and generates carbon dioxide. 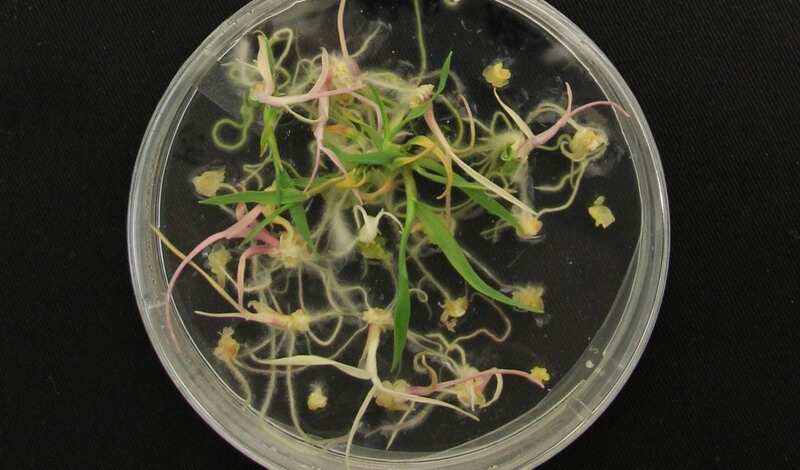 In the initial stage of their research, the research team developed tools needed for this work including an AAFC nifcluster, peptide nanocarriers, DNA delivery technology, microspore culture and regeneration, selectable markers and selection procedures, and a nitrogen-fixation assay for plant cells. Their creation of the AAFC nifcluster is a good example of the important advances they are making. Ziemienowicz explains the ability to fix atmospheric nitrogen is limited to a small number of organisms including certain bacteria. These nitrogen-fixing organisms have about three or four genes responsible for producing the nitrogenase enzyme, which converts atmospheric nitrogen gas into ammonia, and about 10 to 12 genes that produce co-factors needed for nitrogenase activity. “Prior to our work, biotechnologists were able to deliver only two out of 16 essentialnifgenes into plants. Recently, an Australian group reported delivery of 16 nifgenes, but each gene individually. In addition, both research efforts were done in tobacco as a model plant, and not in cereals,” she says. In the next stage of the work, the researchers used their tools to move the AAFC nifcluster into triticale cells. “We deliver the AAFC nifcluster into triticale cells using a unique nanocarrier developed by Dr. Eudes’ team, in particular by Dr. Trevor MacMillan. The nanocarrier is a group of cell-penetrating peptides that carry DNA cargo into a specific location in a plant cell,” explains Ziemienowicz. “We chose plant mitochondria as the best delivery place because these plant organelles offer the most optimal environment for nitrogenase production and activity. We use microspore cells (precursors of pollen) because they can be relatively easily regenerated into entire plants. 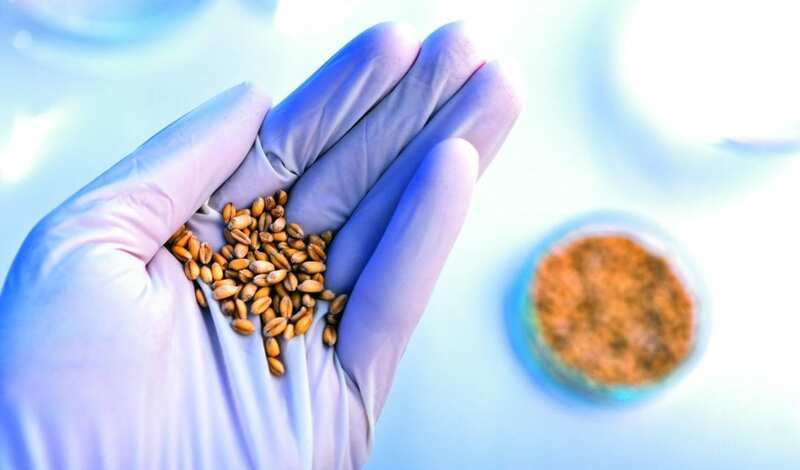 Recently, the researchers have shown that all the delivered nifgenes are indeed expressed in the triticale microspore mitochondria and that the nitrogenase enzyme is produced. Plus, they have demonstrated that the nif-enriched microspores definitely fix atmospheric nitrogen. The research team is now working on regenerating nif-enriched triticale plantlets. If all goes as expected, they will produce triticale plants that have all the characteristics of the triticale parent plus the ability to fix nitrogen. At present, many importing countries have a zero-tolerance policy if GE grain that has not been approved by the importing country is present at low levels in grain shipped to that country. This approach can seriously disrupt trade. Canada has been working with its international partners on alternatives to deal with this issue and has released a policy model to encourage international and domestic discussions on the way forward. What’s the best thing you can do for your crops? Is it making sure they get enough water, sunlight and love? What about having the best herbicides and pesticides to protect them from pests? The best seed treatment? Precision seeding equipment? Well, there’s something more important than that: testing your seed. But why should growers care so much about their seed health? Why should they get their seed tested? Klaas says that particularly in this season, growers will want to make seed testing their first priority, as challenging harvest conditions will play a role in seed health. Submitting a representative sample to the seed lab is of ultimate importance. With a later than normal harvest, farmers are reminded to take a sample from each truck load. Seed Smart has developed a sampling document to help guide farmers to use proper sampling techniques. The idea is to get a snapshot of seed quality of the whole seed lot, (not just what a farmer can access from a bin door). Seed Smart’s next focus is marketing towards trade shows. Klaas says that they’ve been working on materials that will be available at more trade shows, and that they’re amping up more materials to be put in seed processing facilities. In addition to Seed Smart marketing materials, there are now Seed Smart scholarships . Currently, Seed Smart awards two scholarships to encourage the next generation of growers to know the quality of the seed they’re planting. The scholarship targets second to fourth year students enrolled in an agriculture-related field at universities across Canada, with given preference to students at an institution in Alberta. This year, Seed Smart awarded scholarships to Cole Huppertz, a 20-year-old from Westlock, Alberta, studying at Lakeland college, and Kyle Wheeler, a 20-year-old from Strathmore, Alberta, and a student at the University of Alberta. Currently, Seed Smart is staying focused on Alberta, but Klaas hopes that some of their marketing materials can be amended to other locations. “The message is the same no matter where you farm,” Klaas says. Visit the Alberta Seed Processors website www.seedprocessors.ca/seed-smart for resources and tools to help you be Seed Smart. On the Prairies, clubroot appeared in Alberta in 2003, in Saskatchewan in 2008 and Manitoba in 2013. As any grower can tell you, it’s a nasty canola disease that usually worsens in a field every year, partly because the spores are very easy to spread and so hardy they can survive for up to two decades in the soil. Combine this fact with the strong prices that canola fetches these days – widely encouraging back-to-back or two-year rotations – and you have a big problem. Companies are certainly moving as quickly as possible to produce seed with effective resistance to clubroot, but breeding to defend against this particular pathogen involves navigating a wide range of complex challenges. Dr. Jed Christianson,pathology lead at Monsanto Canada, explains that clubroot’s large and quickly-adapting population sizes means that it takes relatively long canola rotations of three or four years to see significant drops in the number of viable spores in the soil, and very long rotations of over 10 years for spores to effectively disappear. Combine this with the fact not all clubroot pathotypes (races) have been identified, and it’s therefore difficult, explains Weidler, to develop a canola variety that is resistant to all potential pathotypes to which a plant may be exposed. More breeding challenges are found in the fact that because canola plants carry no clubroot resistance genes, all the major seed companies are actively testing resistance genes found in rutabaga, cabbage and turnip. However, Weidler notes that because these species are only remotely related to canola, it’s far from easy to transfer genes between them without also transferring additional unwanted genetic “baggage” that negatively impacts yield, canola quality or agronomics. The entire process is a matter of crossbreeding canola with resistant relatives through normal pollination procedures and recovering offspring that are clubroot-resistant. “Those offspring then have to be crossed with canola again and again through many generations, selecting the resistant offspring at each generation for use in the next cycle to obtain plants that maintain resistance, but have recovered the characteristics of high-performing canola,” Christianson explains. DowDupontwasthe first company in Canada to market clubroot resistant hybrids in 2009 (45H29). No matter what resistant canola varieties are marketed, no company can predict how long a new variety will last before it’s compromised. This depends on too many factors, explains Weidler, including the resistance gene, environmental conditions and management practices. All the companies strongly agree that the existence of varieties with resistance is only part of the clubroot solution. Weidler emphasizes the importance of an integrated disease management approach for clubroot, and fully supports the recommendations of the Canola Council of Canada. Unlike other cereal crops affected by Fusarium head blight (FHB), very little is known about FHB in fall rye from a Canadian perspective. We don’t know how serious a concern FHB might be in our rye crops. We don’t know which Fusariumspecies are infecting rye. We don’t have FHB ratings for our current rye varieties. And we have limited information on optimal timing for fungicide applications to manage FHB in rye. So Jamie Larsen with Agriculture and Agri-Food Canada (AAFC) at Lethbridge and Anita Brûlé-Babel with the University of Manitoba have teamed up on a project to develop FHB-related information and tools that rye growers need. “This research is new territory from a Canadian and even a North American perspective,” says Larsen, who has breeding programs for open-pollinated fall rye and several other cereals. Larsen became interested in the issue due to several factors that have emerged in recent years. “Initially when I started working in rye, I had looked at the literature and I thought the disease wasn’t a major problem. Also, the main areas where rye is traditionally grown – north of Swift Current and around the Great Sand Hills area in Saskatchewan – aren’t huge Fusarium head blight areas. And rye has this natural ability to be tolerant to a lot of diseases. So I wasn’t too worried about Fusarium head blight,” he explains. “But then I sent some rye varieties to Ontario as checks in a triticale experiment. And as I was walking along in those plots, I saw a rye variety with its head completely glued shut and pink with Fusarium. I’d never seen anything like it.” As well, he found out FHB occurs in Prairie rye crops through his work as the coordinator for the fall rye cooperative registration trial. Each year, the trial is grown at 15 locations across Western Canada, and in some years Fusarium-damaged kernels (FDK) have been found in the grain samples from the trials. Another driver for Larsen was the potential, especially with the new hybrids, to sell more rye into the feed and food markets. To help in realizing that potential, he saw the need to know more about FHB’s impacts on rye yield and quality – particularly since Fusariumspecies can release toxins that can limit the use of grain in feed and food – and the need to develop FHB-resistant rye varieties and other tools to manage the disease. A widespread concern in Manitoba, Brûlé-Babel conducts screening for FHB resistance as part of her winter wheat breeding program. So Brûlé-Babel and Larsen brought together their different areas of expertise to develop their plans for the project. Also joining the project is KWS, the German company that has developed several hybrid ryes for Canadian growers. Brûlé-Babel is screening fall rye lines for FHB resistance at her FHB nurseries at Winnipeg and Carman. To increase the potential for disease development, her research team inoculates the rye lines with Fusarium graminearum, the most common of several Fusariumspecies that cause FHB in Manitoba cereals. The FHB responses of the rye lines are measured in three ways: disease levels in the field; FDK levels in the grain; and concentrations in the grain of deoxynivalenol (DON), the primary toxin produced by Fusarium graminearum. In 2017, they evaluated about 70 rye lines, including materials from Canada, the United States, Germany, Russia and other countries, as well as lines from Larsen’s breeding program and from KWS. Current Canadian rye cultivars are included in the screening so growers will be able to get information on FHB ratings to help in choosing rye varieties for their farms. For 2018, the researchers have added more rye lines from KWS, so the total is now about 130 lines. The 2017 results showed that FHB definitely occurs in rye and that some lines are more resistant than others. “Overall, we’re not seeing very many lines that are as susceptible as our susceptible wheat checks. And most of the rye lines are in the resistant to intermediate range,” notes Brûlé-Babel. The testing for FDK and DON in the 2017 samples will be done in the coming months by KWS. However, based on what Brûlé-Babel’s team observed in the field and as the grain samples were harvested, it appears that FHB infection often tends to cause the rye plant not to set seed. As a result, the FDK levels are lower than would be expected in a wheat crop with similar field infection levels. Brûlé-Babel had heard anecdotally through their KWS collaborators that DON levels in rye tend to be quite low. She suspects this could turn out to be true if there aren’t many infected kernels in the harvested grain to contribute to DON in the samples. 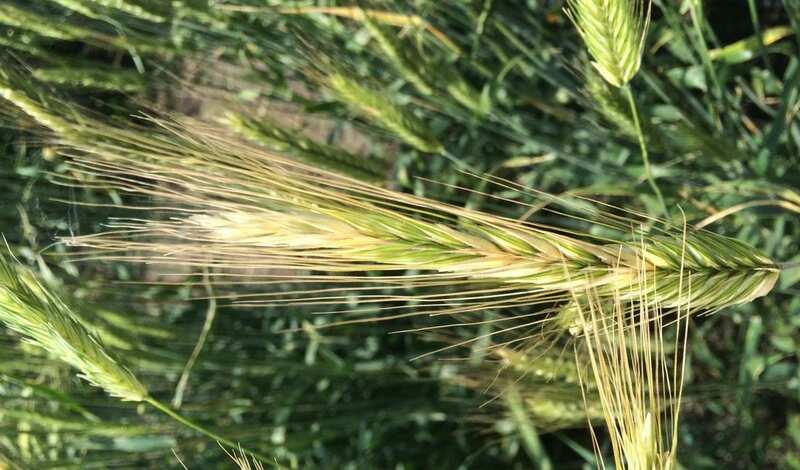 “So my guess at this point is that the biggest problem from Fusarium head blight for rye producers might turn out to be yield loss as opposed to a crop that you can’t market [due to FDK and DON],” she says. Once they have two years of data from the nurseries, Larsen will start making crosses with some of the FHB-resistant lines so he can develop new open-pollinated varieties with this trait. Brûlé-Babel is also leading two other FHB/rye studies for the project. One study is looking into other Fusariumspecies that cause FHB in rye. “Not a lot is known about which Fusariumspecies infect rye [on the Prairies], so we’ve worked with Maria Antonia Henriquez at AAFC’s Morden Research and Development Centre. She does a Fusariumsurvey every year, collecting diseased plants from [spring wheat and winter wheat fields in Manitoba]. So we asked if she could also collect samples from rye fields,” explains Brûlé-Babel. One of Brûlé-Babel’s graduate students, Duoduo Wang, has isolated the Fusariumspecies from the Manitoba rye samples. Wang has identified the species based on the appearance of the fungi when grown in the lab, and she will be doing some DNA marker work to confirm the identifications. The preliminary results indicate that the most common species was Fusarium graminearum, but other species were also present. In 2018, Wang will be doing a greenhouse study to examine the infection process and see how the different Fusariumspecies interact with selected rye cultivars. Wang is also working on the other study, which is investigating fungicide timing for managing FHB in rye. “Very little information is available on fungicide timing for rye for this disease. We need to develop some basis for timing recommendations,” says Brûlé-Babel. According to Larsen, the general recommendation for fungicide timing for FHB in wheat is to spray two days after heading because wheat plants usually flower about two days after heading. But in rye, flowering might not start until seven to 14 days after heading. In that long heading/flowering period, what is the best time to apply a fungicide? Brûlé-Babel also points out that, because rye is an outcrossing species, its florets are open for a longer period than the florets of a self-pollinating species like wheat, and it may be that a fungicide might interfere with pollination and seed set in rye. From the rye lines being screened in the nursery, Wang has selected an FHB-susceptible cultivar, a cultivar with an intermediate response, and an FHB-resistant cultivar to use in the fungicide trials. The trials will take place at Winnipeg and Carman. The fungicide will be Prosaro, a commonly used fungicide that is registered for FHB suppression in wheat and barley. The trials will compare four fungicide timings: at 50 per cent heading; at 10 per cent anthesis, which is when 10 per cent of the flowers on the spike have extruded anthers; at 80 per cent anthesis; and at six days after flowering. Brûlé-Babel’s team will be inoculating the plants with Fusarium graminearum. The trials will also have two types of check plots: inoculated with no fungicide and non-inoculated with no fungicide. This pioneering project will lead to practical information, improved varieties and other tools for rye growers in Western Canada and perhaps other regions of the country. This FHB research is part of a larger project led by Larsen on rye disease issues that also includes work on ergot and rust. Saskatchewan’s Agriculture Development Fund, Western Grains Research Foundation, Western Winter Wheat Initiative, Saskatchewan Winter Cereals Development Commission, FP Genetics, KWS and Bayer CropScience are funding the project. The Alberta Wheat Commission (AWC) is pleased to announce funding commitments of $175,000 over five years through the Integrated Crop Agronomy Cluster (ICAC) to five research projects aimed at developing leading edge agronomic practices for farmers. Federal Agriculture Minister Lawrence MacAulay recently announced $6.3 million in funding through Agriculture and Agri-Food Canada’s CAP program to add to ICAC’s total investment of $2.6 million. Chaired by the Western Grains Research Foundation (WGRF) and formed by cropping groups across Canada, ICAC is a cross-commodity agronomy cluster initiative aimed at encouraging increased investment in agronomy-focused innovation. ICAC takes a whole-farm approach to regional and national needs and long-term sustainability innovation including soil, water, air and economics. AWC looks forward to providing project summaries and updates as they become available. Genome Canada in partnership with Agriculture and Agri-Food Canada (AAFC) has recently launched the 2018 Large-Scale Applied Research Project Competition: Genomics Solutions for Agriculture, Agri-Food, Fisheries and Aquaculture (2018 LSARP). This funding competition aims to support projects that will use genomics to advance the sustainability, productive capacity, and competitive position of the Canadian agriculture and agri-food & fisheries and aquaculture sectors, and thereby strengthen Canada’s economy and the wellbeing of Canadians. There is approximately $30 million available through Genome Canada, and up to $16 million from AAFC. 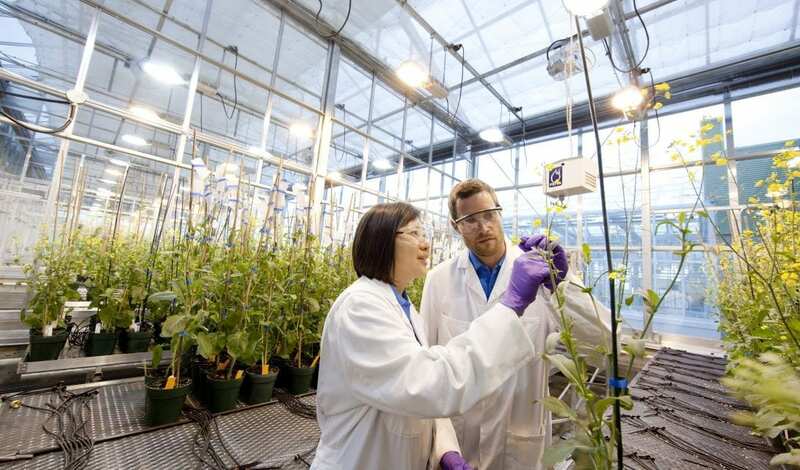 Successful projects can receive up to $4 million from Genome Canada, and $3 million from AAFC over a maximum of four years, with a 1:1 co-funding ratio to Genome Canada’s contribution. More information about the Request for Applications can be found on Genome Alberta’s website. When seeking funding, researchers are encouraged to refer to the priorities and target research outcomes in the Canadian Beef Research and Technology Transfer Strategy. Deadline for submitting registrations to Genome Alberta is August 7, 2018, and deadline for submitting registrations to Genome Canada is August 16, 2018. Interested Alberta-based researchers should contact Niall Kerrigan at Genome Alberta. This two-year project started in April 2017, and Rajagopalan’s team has already completed two of the objectives. “We have completed the testing of the effects of Fusarium and rust resistance in different varieties under normal and accelerated growth conditions. And we have completed the very large-scale study to understand the effects of accelerated growth conditions on various wheat varieties. So we have a really good understanding of what conditions work best for the multiple varieties of durum and bread wheat that we have tested.” The researchers are currently working on the other two objectives. What Makes Cereal Crops More Stress-Tolerant? Whether barley, wheat, maize or rice: The grass family includes all the major cereals. They are vital for feeding the world’s population. Farmers produce 80 per cent of all plant-based foods from grass crops. This success is due in part to the plants’ ability to adjust more quickly to dry conditions and sustain lack of water better than other plants. The plant researchers Professor Rainer Hedrich, Professor Dietmar Geiger and Dr. Peter Ache from Julius-Maximilians-Universität Würzburg (JMU) in Bavaria, Germany, are looking into these questions. They studied brewing barley to determine why grasses are more stress-tolerant and are therefore “better” crop plants than potatoes and the likes. The scientists discovered that this difference can be attributed to the protein SLAC1 of the guard cells. Just two amino acids, the building blocks that make up proteins, are responsible for the plant’s drought tolerance. “We now want to find out whether this small difference can be harnessed to make potatoes, tomatoes or rapeseed more tolerant to stress as well,” says Rainer Hedrich. The JMU researchers began scrutinizing microscopically small leaf pores called stomata. These openings admit carbon dioxide for photosynthesis into the plant. But they also serve as outlets for water. To prevent losing too much water through evaporation, land plants have learned during evolution to actively open and close their stomata using special guard cells. Membrane proteins such as SLAC1 play a key role in this regulatory process: acting like channels, they guide ions into and out of the cells. The JMU researchers have demonstrated that the subsidiary cells absorb and store the potassium and chloride from the guard cells when the pore closes. When the stoma opens, they pass the ions back to the guard cells. “Our cereals use the subsidiary cells as a dynamic reservoir for osmotically active ions. This ion shuttle service between guard cell and subsidiary cell allows the plant to regulate the pores particularly efficiently and quickly,” Dietmar Geiger explains. 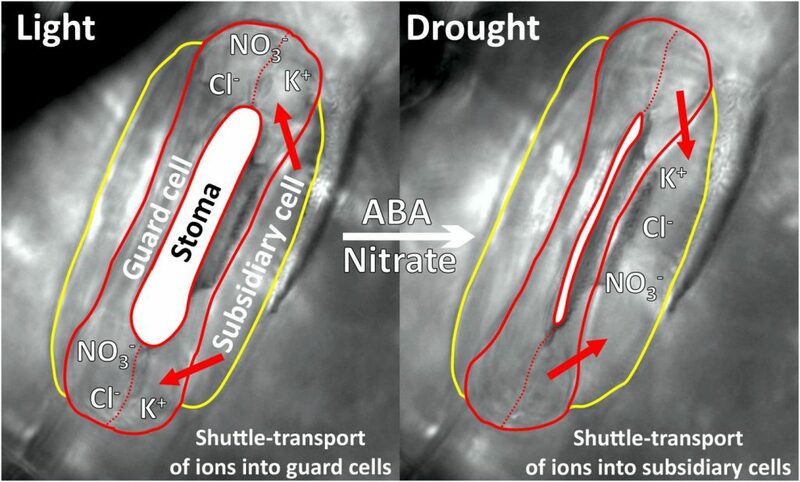 “Interestingly, we found that nitrate must be present in brewing barley and other grass cereals in addition to ABA to enable the pore to close,” Peter Ache says. The nitrate concentration allows the barley to measure the shape the photosynthesis is in. If it works smoothly, nitrate levels are low. Which mechanism is responsible for the difference in stoma regulation at the molecular level? To answer this, the researchers analyzed SLAC1 channels of various herbaceous plants compared to grasses. This allowed them to identify the “nitrate sensor” of the grasses: It is comprised of a motif of two amino acids which first occurred in moss during evolution and was subsequently further optimized to give the guard cells their unique properties. In a next step, the team of researchers wants to establish whether herbaceous agricultural crops also benefit from having a nitrate sensor. To achieve this, the scientists want to fit Arabidopsis plants that lack the SLAC1 channel with the SLAC1 channel of barley. “If this step increases their stress tolerance, we can consider breeding optimized potatoes, tomatoes or rapeseed,” Hedrich says.